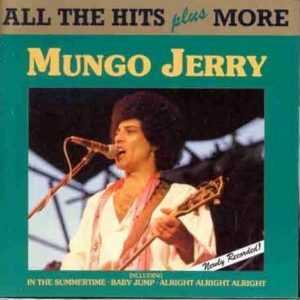 1990 saw the release of a much loved Mungo Jerry album, Snakebite, a rocking masterpiece that combined both rock and skiffle, and perfectly exhibited the talents of the band at time – Ray Dorset, Tim Green (guitars), Steve Jones (keyboards), Les Calvert (bass) and “Crazy” Jamei Roberts (drums). 6th April Saarlendhalle, Saarbrucken, Germany. 20th April Sportshalle, Herne & Eisssporthalle, Rheine, Germany. 30th April Stadthalle, Bremerhaven, Germany. 18th May Sydenham School, Bridgewater. 25th May Prestonfield Hotel, Edinburgh. 1st June Rock & Blues Festival, Zurich, Switzerland. 8th June Lorely Open Air Festival. 22nd June Hessanthe Lorch, Germany. 29th June Open Air Sports Palace, Vienna, Austria. 12th July Stadtfest, Duisburg, Germany. 13th July Bonn Open Air Festival, Germany . 2nd October Stadthalle, Belefeld, Germany. 3rd October Stadthalle, Hamburg, Germany. 5th October Rheingald Halle, Mainz. 19th November Schutzen Halle, Brillon, Germany. 31st December Intercontinental Hotel, Muscat. Midnight Special/Take This Hammer/San Francisco Bay Blues/Let’s Work Together/Alright Alright Alright/Sugar In The Bowl/Oh! Susanna/Marie’s Wedding/Pick a Bale O’ Cotton/Lady Rose/We Shall Be Free/Have a Whiff On Me/I’m The Urban Spaceman/Keep Your Hands Off Her/Jean Harlow/Hey Gyp/Gloria/O’Reilly/Bottle Up & Go/Dimples/In The Summertime/Jesse James/Birthday Blues/Mighty Man/Banana Boat Song/Mona/Baby Jump/Long Legged Woman Dressed In Black/Red Leather & Chrome/In The Summertime (reprise)/See You Later Alligator/Whole Lotta Shakin’ Goin On. 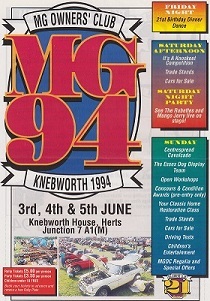 Amazingly, we don’t have any records of dates for 1993. 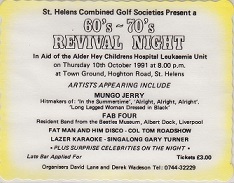 At this time, the situation with the fan club was that it temporarily ground to a bit of a halt before continuing the following year. 6th October Barron’s Night Club, Swansea. 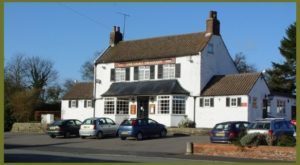 17th December Wood Green Animal Centre, Godmanchester. 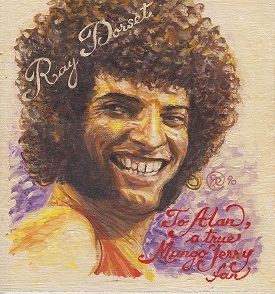 In 1990, I was sent a hand painted portrait of Ray by Jarle Jorgensen, a very talented Norwegian guy. 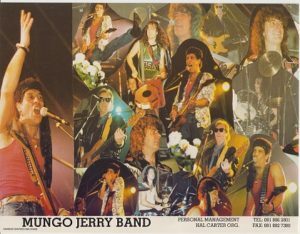 A compilation cassette of Mungo Jerry’s appearances at the Processed Pea Folk Club in both 1991 and ’92 was made available to fan club members. 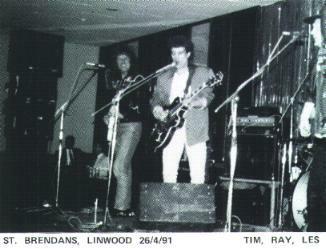 Ray Dorset was backed by Alan Johnson (guitars), and Jamei Roberts (drums) in 1991, and Alan Johnson (guitars) Simon Baker (drums) in 1992. “I asked people like Derek Wadeson their opinions of the track listing I had compiled, getting the thumbs-up on some and a no-no on others. “I was trying to blend the tracks this time, going for a raunchier rock side and some other sing-a-long on the other. “My biggest problem is that if I use the originals, because of the lousy deal on record royalties we first had, I don’t make any money. “When the records were selling in enormous quantities that was OK as you made money out of the sheer volume. “So on this release, I used a couple of new recordings of the hits as well as live cuts like Baby Jump and threw in some original demos of things like We’re OK to make it more interesting. “I also featured Pushbike Song, which we recorded in ’89 because everybody thinks I wrote it anyway! From Beyond The Summertime by John Van der Kiste and Derek Wadeson – A & F Publications, 1990. 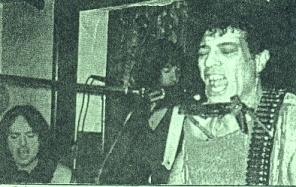 In 1991, Derek Wadeson, secretary of the the Mungo Jerry Fan Club introduced the brand new fanzine for the first, replacing the regular newsletters that preceded the ‘zines. 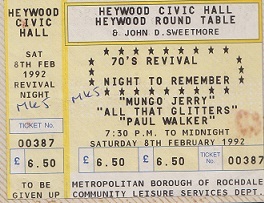 Originally called Keep On Rocking, they became known as Mun-go For It and racked up 19 issues before being replaced by fan club newspapers and then the Mungomania website. 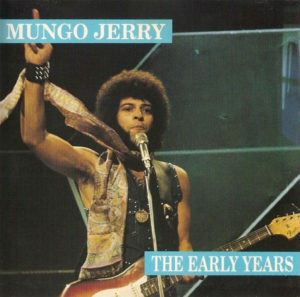 One of the more notable Mungo Jerry compilation albums was The Early Years compiled by Mark Brennan (now at Cherry Red Records) and Laurie Prior with sleevenotes courtesy of the fan club’s very own Derek Wadeson.